If you have a large stone mortar, you're in luck: this job can be done quicker than the time stated for this recipe. Unfortunately, I only have a small mortar and pestle. 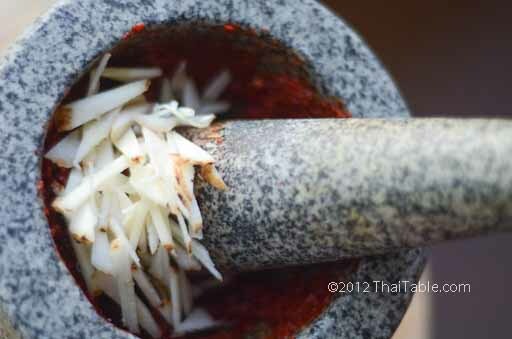 For hard ingredients like lemongrass and chili peppers, it takes me 5 minutes to pound each ingredient into pulp. Always pound dry spices first. In this recipe, it's the peppercorns. Their round shape causes them to escape the pestle and hide amongst other wet ingredients. Follow then with the hardest ingredient to grind, the chili peppers. Chili peppers are always pounded with salt. Salt acts like sand, keeping the wet peppers from slipping. Next, pound the hard ingredient with the least amount of liquid. That means galangal, lemongrass, kaffir lime zest. Dry or powdered turmeric can be substituted for a fresh roots, but it will lack the fresh scent. 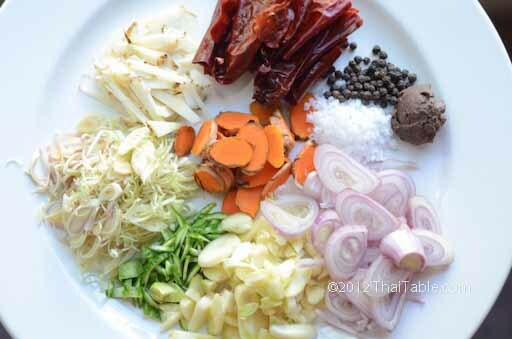 Using fresh lemongrass, and thinly slicing it first makes pounding it easier. Break dried whole chilis into pieces and soak in plenty of warm water. In this recipe, to reduce the heat, I use the combination of 2 types of chili peppers, the larger and milder and the smaller and hotter. For the true southern palate, the small fiery Thai chilis are used. The quantity of the peppers will vary from family to family. On the extreme end all 20 hot chili peppers are the hot ones. However, the combination works for me. Slice lemongrass into thin slices. Peel garlic and shallots and slice them thinly. Peel the zest of kaffir lime and slice into thin pieces. You can also use a grater. Slice galangal into match stick pieces. Chop tumeric into smaller pieces. In a stone mortar, grind peppercorns into fine powder. Pound lightly to crack and break the peppercorns open so that the round balls don't bounce out of the mortar. When most the peppercorns are split, you can pound harder. When the peppercorns are powdery, squeeze out the water from the chilis and add to mortar. You may want to cover your hand with a glove or a plastic bag since the heat will stay on your fingers for hours, even after several washings. 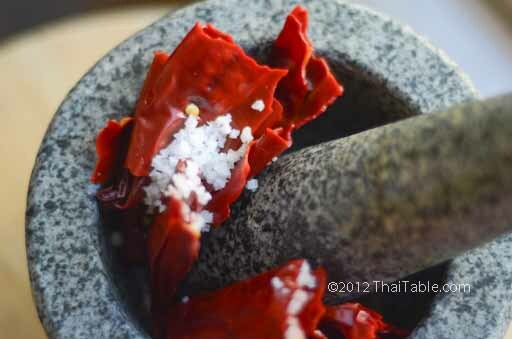 Add salt and pound until the chili peppers turn into a paste. Add galangal and lemongrass. Pound until everything is mixed and ground into a paste. Add kaffir lime zest and garlic and pound. Add turmeric and pound it into a paste. 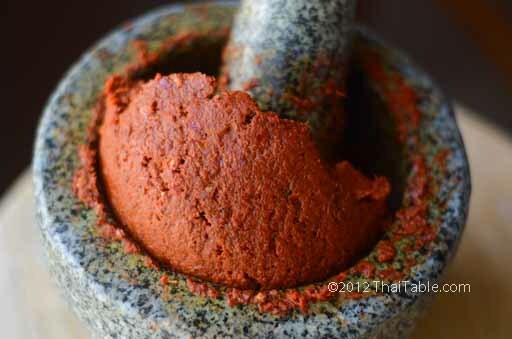 Add shrimp paste and pound to mix. Add shallots and pound everything together. It's done when you can no longer see chunks. 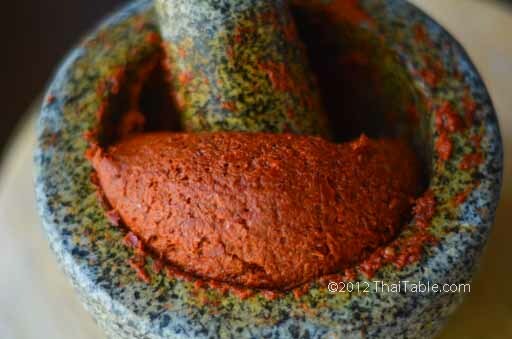 The paste should be smooth with uniform bright red in color. 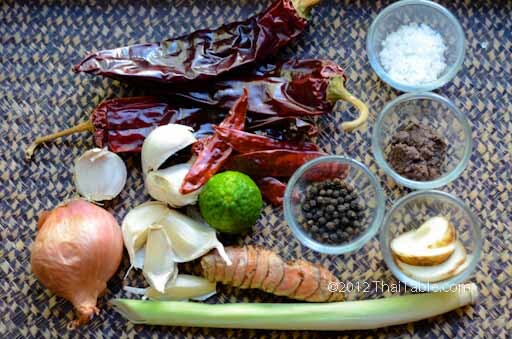 The curry paste can be kept in the fridge for a month and in the freezer for a year.